Makati City Representative Abigail Binay posed a challenge to a group behind the circulation of an alleged white paper, which details the involvement of the Binay clan in the PDAF scam. 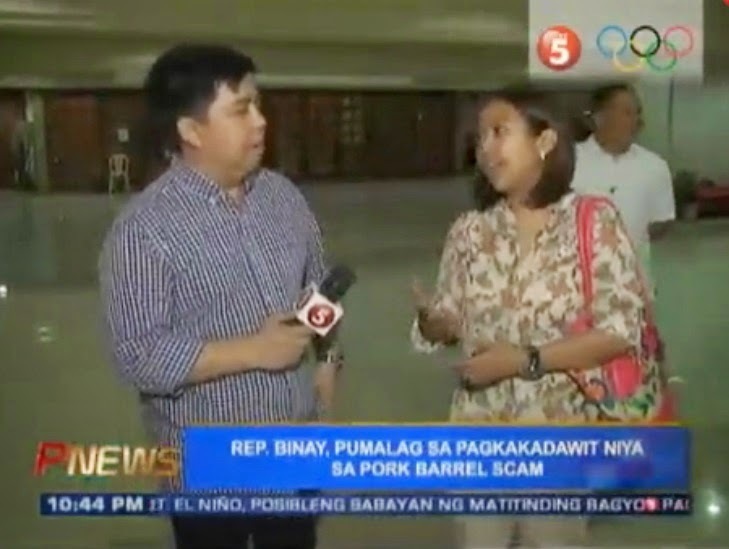 Speaking to TV5's Jove Francisco, Binay said that it is part of a demolition job that they've been expecting since last year, in part to derail her father's presidential bid in 2016. "Lumabas siya. Kung kaya niyang sabihin na ako ang gumagawa niyan, I will face them. I want to face my accuser," she said. In a separate statement. the younger Binay called it a "poor and amateurish attempt to drag the name of the Vice President in the PDAF scandal." "The records of the Vice President, Sen. Nancy and myself have been made open to the public for review. These records will show that the projects have been properly implemented and fully liquidated," she said. On a side note, it seems that Francisco is keeping track of the biggest stories this past week. Just over the weekend, he also snagged a rare interview with Batanes Representative Henedina Razon-Abad, wife of Budget Secretary Butch Abad.